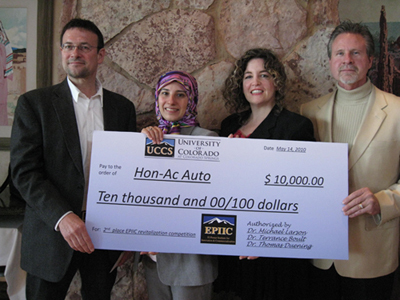 The El Pomar Institute for Innovation and Commercialization (EPIIC) assists creative individuals and organizations in transforming innovative ideas into economic opportunity. EPIIC will serve as a catalyst to create a community that fosters the communication, collaboration, and sharing of resources necessary for a thriving environment of entrepreneurship and successful startup ventures, particularly in the Southern Colorado region. Identify emerging technologies and technology ideas – by bringing commercially viable ideas to the local region. Provide initial assistance for new technology development – by fostering development of new technologies and nurturing innovators during initial development stages. Promote a local dialogue about new venture development – through forums, conferences, and symposiums. Provide educational resources that foster new technology development – through workshops, consulting services, and training. Provide business links – by partnering with agencies that help developers of new technologies pursue paths to successful businesses. Build an environment – that provides a context for community and communication-building between parties; necessary for creating a successful environment for startups and technology transfer. Small Business Innovation and Research (SBIR) activity where members of the university community can partner with an entrepreneur from the community to develop a technology into a commercial reality. Education and Innovation, including workshops and seminars for entrepreneurs to understand government funding programs as well as how to test ideas and the process of taking ideas to market. Economic development including specific cooperative efforts with other agencies to recruit and retain businesses to this area.